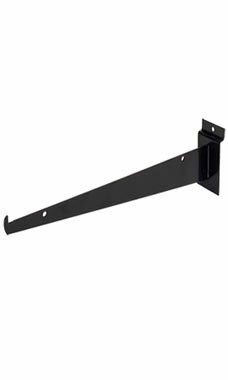 Show off your merchandise to your all of your paying customers on Slatwall shelves that are supported by these Metal Slatwall Shelf Brackets. Measuring out a 14 inches, this bracket an easily support heavy loads and can hold shelves that are up to 14" wide. These brackets will help to increase the amount of space that you have available on your Slatwall. This bracket is at the lowest price you will be able to find, and is an absolute steal. In stock and available for immediate shipment. Sleek black! Great thank you! It is what it says it is! Convenient and sturdy. Great for quickly adding shelves anywhere on slatwalls.